Doha has welcomed the completion of Katara Studios, a collaboration between internationally recognised facility design leaders Walters-Storyk Design Group (WSDG) and Acoustics Design Group (ADG). The 65,000 sq. ft. / 6,000 sq. m. compound, commissioned by The Katara Committee and located in the Qatari capital’s Middle Eastern Art Development Centre, is said to be of one of the largest and most technically advanced recording/feature film audio post production complexes to date in the Middle East. WSDG co-principal, Sergio Molho, reports the project dates back to 2012, when WSDG was retained by Elie Wakim, head of the acoustical division of leading Doha-based, Imar Trading & Contracting. The 40+ room complex is distinguished by the 3000+ sq. ft. / 225 sq. m. Studio 1 Live (orchestral) Room, crowned by a 30’ / 9m-high ceiling, and capable of hosting 80+ musicians. 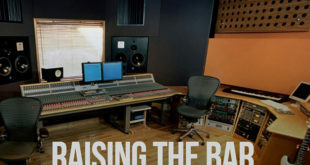 Katara Studio 1 features a 96 fader Neve 88RS Console and 5.1 PCM BB5 surround sound system as well as three spacious, multi-configurable, ISO Booths; a mezzanine and a VIP lounge, designed to facilitate the recording of indigenous and/or jazz sessions. 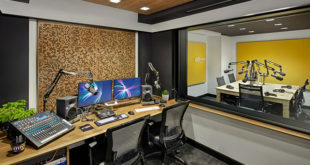 The facility also features a Studio 2 Live (rock ‘n’ roll) Room and a 435 sq. ft. / 40 sq. m. CR outfitted with an 80 channel API Vision Console. 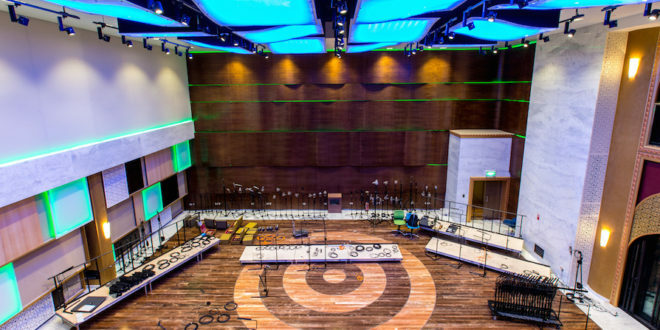 “This extraordinary facility required an extremely complex acoustic program,” revealed WSDG project manager, Joshua Morris. “The business plan was to provide Middle Eastern artists with a superb alternative to European studios and, simultaneously establish Doha as an appealing destination for international recording artists. 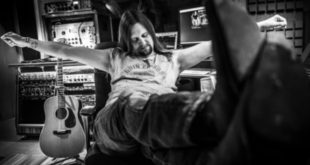 “In addition to three recording studios, Katara Studios encompasses a sophisticated mastering suite, and a Dolby Atmos, post-production suite (with VO booth) for feature film mixing,” Morris said. 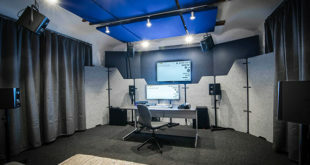 “Two spacious composer rooms, three audio prep rooms; a video grading suite and a video edit suite all coalesce to provide clients with virtually every requirement for writing, tracking, mixing and mastering at the highest level of performance,” he added. To complete the fine-tuning process of the control and live rooms, WSDG Brazil partner/GM, Renato Cipriano, WSDG Europe, partner/GM Dirk Noy, and the entire international group including project engineers, Gabriel Hauser and Thomas Wenger, collaborated on low frequency design, and comprehensive acoustic analysis and prediction. Additionally, Silvia Molho at WSDG envisioned a series of innovative “Magic Ceiling Cubes,” to serve as membranic, low frequency absorbers, and to provide mood lighting for Studio 1. Molho worked closely with WSDG Spain project engineer Marc Viadu to identify fabricators for these custom-built ceiling clouds. In terms of aesthetics, Elie Wakim and Katara Studios management were committed to incorporating authentic Arabic design elements throughout the complex. Molho, along with WSDG co-founder and interior designer, Beth Walters, performed extensive research on Islamic and Muslim graphic arts and architecture. Studying the vibrant Arabic colour palette, they developed methods to incorporate elements of intricately patterned Islamic calligraphy and mosaics throughout the complex.